Cru Café is Charleston’s home to some of the best gourmet comfort food in the Lowcountry. Cru Café is the culinary creation of renowned Le Cordon Bleu graduate Chef John Zucker. Opened in 2002 in response to overwhelming demand, Cru Café is a culinary destination off the beaten path in a classic 18th century Charleston single-style home. 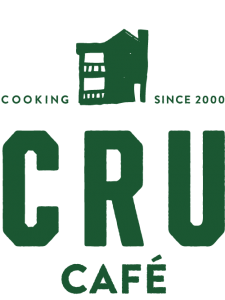 Cru Café and its award-winning Cru Catering division are consistently ranked as top eateries by locals and tourists alike. From our famous Four Cheese Macaroni to our tasty Thai Seafood Risotto, we feature something for everyone. And if you’re in the mood for lighter fare, try our Chinese Chicken Salad or Duck Confit Salad. Guests of the restaurant can enjoy daily specials, indoor and outdoor porch seating, a wine list tailored to the varied menu, local beers, and rich, mouthwatering desserts. We invite to stop in and enjoy a delicious meal with us today.